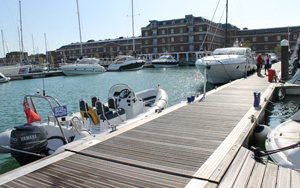 Today fleet boats have gathered at Royal Clarence Marina, Gosport, for the start of the Channel Islands & West Country Cruise. Despite the sunny, warm weather, it’s been a very blustery day and unfortunately the weather has prevented a few boats from reaching the start point. A briefing was held at 6pm at G’s Restaurant, which was followed by welcome drinks and a delicious buffet. It’s been a fantastic evening and a great start to the cruise. The MBM team will look at the weather in the morning and the plan for tomorrow is for the control RIB Time Flies to go out at 6am to check the conditions in the Channel, in view of the fleet departing between 7.30am and 8.30am.